The Pecan Grove Marina stands out among the marinas and boat slips that veritably overrun the small town of Oriental for three distinctive reasons: location, location, location. Set slightly inland from mile marker 182 along the Intracoastal Waterway (ICW), the marina has a unique locale that's just barely surrounded by low lying land, making it an exceptionally peaceful harbor during virtually any and all wind and weather conditions. 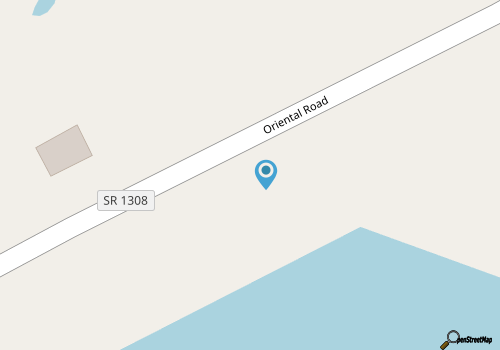 As a bonus, the site, which is located just south of the main Oriental downtown region, is an easy outlet to the ICW, which spans from the Chesapeake Bay all the way to Florida and the Gulf States. 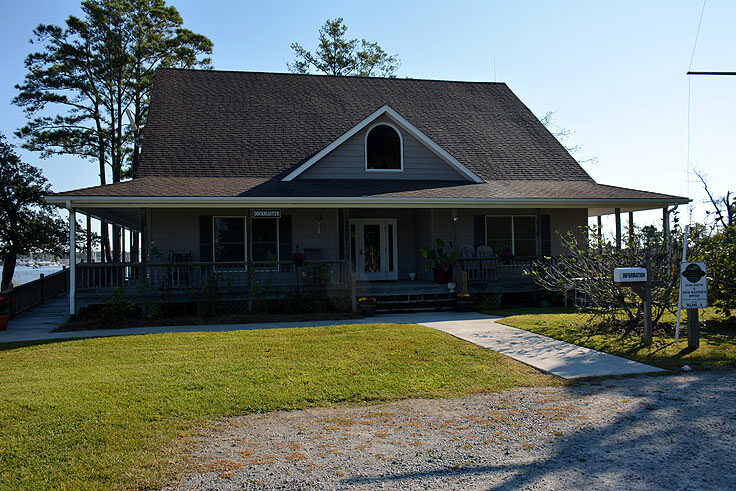 The marina is also an easy cruise away from the prime fishing grounds of the Neuse River, the Pamlico Sound, and the secluded beaches of both the Cape Lookout and southern Outer Banks shorelines. All of these factors, as well as the fantastic on-site amenities that make an extended visit a full vacation, make the Pecan Grove Marina an enticing attraction along the shores of Coastal Carolina's famed town of Oriental. The Pecan Grove Marina is located on the western side of the Oriental Road Bridge, ensuring easy proximity to the coastal town's attractions, shops, and eateries. For many mariners, however, the best attribute of this 222 deep-water slip marina is the setting. 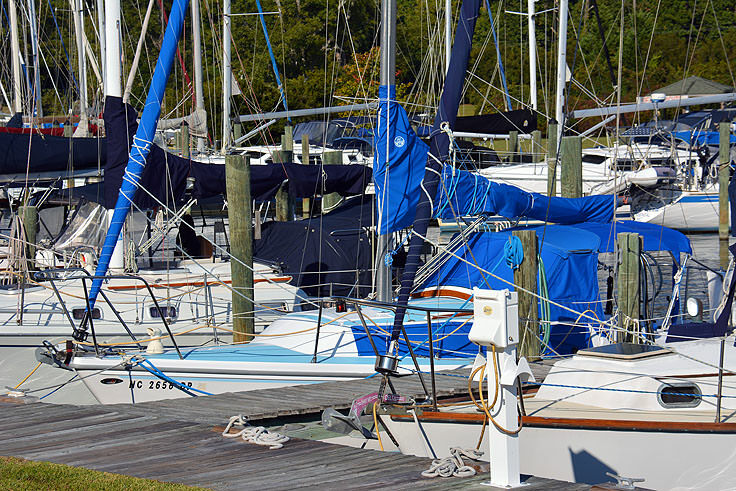 The marina is bordered by land on three of its four sides, ensuring that heavy wind conditions - a hallmark of the Pamlico Sound-bordering region - have limited effect on the mariners who are docking for an evening or two. All slips at the Pecan Grove Marina feature 30/50/100 amp service and wireless internet access. Unlike other neighboring marinas, Pecan Grove Marina frowns upon transient mariners, Liveaboards, and fishing charters, however its amenities for members who use the space as a home for their boat, and a launching point for an ICW or soundside adventure, are certainly plentiful. On site, Pecan Grove Marina features a free pump-out station for its patrons, bath houses, and an exceptional clubhouse on the point that overlooks the scenic Oriental Harbor. The clubhouse is arguably the most celebrated aspect of Pecan Grove Marina, as the pretty coastal structure, complete with a wide front porch to showcase those waterfront views, has a world of amenities indoors and out for a fun day off the water. Pecan Grove Marina patrons can take a dip in one of the clubhouse's two outdoor pools, (which are open seasonally), refresh after a hard day on the water in one of three bath houses, or simply meet and greet with their neighbors in the well-appointed lounge room, or along the wide open front porch. Suffice it to say, the clubhouse is often the busiest place at Pecan Grove Marina, and hosts a number of seasonal cook-outs, pig pickins', and other maritime community events. Essentially, Pecan Grove Marina is best utilized by Oriental and Coastal Carolina fans who need a long-term spot to dock and launch, but who have an inherent sense of community, and are in search of a locale with plenty of on-site extras. Boat slips are available both for long-term rent and for sale, and interested customers and patrons can access information on obtaining their own little slip of Oriental waterfront online at http://pecangrovemarina.com/slip-sales/, or by calling the Pecan Grove Marina directly at 252-249-2532. Rental rates vary, but slips for sale, depending on size, can range widely from $30K to well over $100K, although financing is available at nominal interest rates via the Pecan Grove Marina. The Pecan Grove Marina is effectively a secluded and a beautiful oasis that offers an ocean's worth of protection to its patrons. With a not-quite landlocked locale at the mouth of the Neuse River, patrons will have no trouble feeling safe leaving their vessel for an indefinite period of time during virtually any weather condition. 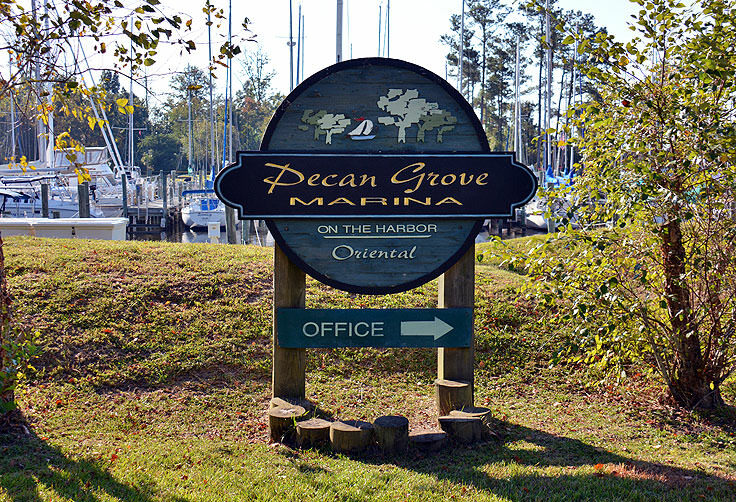 A fabulous location that is complimented by an inclusive yet friendly community, the Pecan Grove Marina is a perfect docking location and waterfront playground for Oriental mariners who are in it for the long haul.